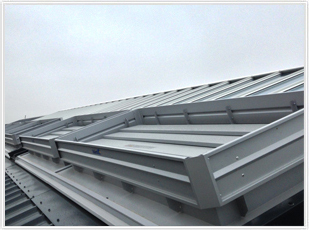 Lareine Engineering is one of the UK's leading designers and manufacturers of rooflights, roof access hatches and ventilation solutions. We are the only UK business currently able to offer all aspects of daylighting and ventilation for commercial, industrial and large-scale residential properties. 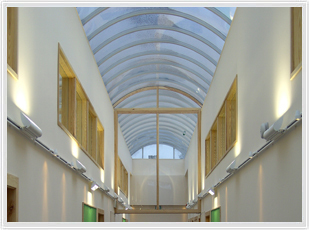 We design and manufacture roof light systems, natural and smoke ventilation products and systems, as well as offering a range of products through distribution partnerships. This capability is supported by full on-site installation and maintenance services. Our products are compliant with UK Building regulations and we offer professional indemnity insurance on all installations. We are UK certified partners with leading global manufacturers of ventilation systems, Brakel (part of Kingspan Light+Air), and WindowMaster. We offer a range of polycarbonate rooflights, including modular domes and pyramids and continuous barrel vault rooflights. We use Makrolon longlife UV resistant polycarbonate sheet which carries a 10 year warranty against breakage, excessive yellowing and loss of light transmission. We can supply glass rooflights in a wide variety of configurations and specifications, including faceted pyramids and segmented domes, mono and dual pitch rooflights and our Monovision range of flat glass rooflights. We offer a complete design-to-installation service. 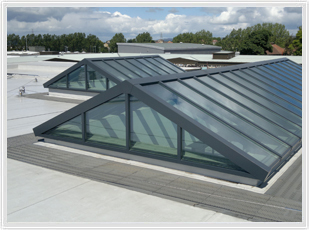 In addition to our rooflight systems, we design and manufacture products for natural ventilation, smoke ventilation in the event of fire and safe roof access. Our new louvre ventilation system offers a practical and attractive solution for external ventilation terminals in all kinds of buildings.